Can Google Fiber finally bridge America's digital divide? Google Fiber wants the people of Kansas City to know that it’s committed to the city and providing a superfast broadband service. In early February the tech giant attracted some goodwill by launching a free gigabit Internet service in a low income housing community in the city. One hundred homes have been connected and Google is working with housing initiatives like ConnectHome to reach 1,300 families in the area. This latest program, where Kansas City is the first to benefit, was launched by US Secretary of Housing and Urban Development Julian Castro. Kansas City has for years tussled with its digital divide that involved not only income but also race. Google Fiber had previously launched in both parts of the city, which sits on the Kansas and Missouri border, but it failed to reach the neighbourhoods that needed it the most. The ConnectHome initiative is aiming to rectify that and Kansas City is hoped to be the first of many cities that addresses its digital divide through the program. ConnectHome was launched last year by President Obama and will first target 275,000 homes in 27 cities and one tribal nation. Several ISPs and other companies are involved. Google is certainly the biggest and will be rolling out its Fiber services to select housing projects in Atlanta, Durham, and Nashville. These services will be free for now. Other companies like CenturyLink are offering services in Seattle, and Cox in New Orleans and Baton Rouge, however these services are low cost rather than free like Google Fiber. “The US has some of the most expensive broadband in the world, while lagging far behind other countries in internet speeds. And for families in affordable housing, cost can be one of the biggest barriers to getting online,” said Google in its announcement. Public housing is a difficult resource to manage for many city councils, especially in making sure that there are enough suitable buildings and amenities nearby for parents, children, and the elderly. These amenities have now come to include digital services and broadband access, especially as government services and job applications are increasingly online. Furthermore, US government research continues to link good internet access with more opportunities and higher income. This is a huge hurdle to cross. The digital divide refers not only to the actual connection to the internet but the necessary hardware and digital literacy skills to take advantage of these tools. We’ve seen many local programs run by community groups that have tried to address this like the Communities Wired! program in California. But these sorts of programs cost a lot of money, as seen by the likes of Austin, Texas’ Pathways initiative which was one of the first groups to utilise free Google Fiber for low income areas before this more widespread program kicked in. Connecting For Good, another Kansas City group, has been campaigning and organising for years to bring digital resources to disadvantaged areas of the city, and welcomes this Google Fiber initiative. It says the city has become a “primary laboratory” for closing the digital divide. With a tech giant like Google on board, it’s difficult to argue against that idea. Kansas City’s digital divide issues are well documented but whether or not this will be a tide changer remains to be seen. However it could provide a model for more cities to build off of in the future. For now, Connecting for Good continues to carry out its programs like opening computer access centres in various neighbourhoods throughout the city and its surrounding areas. 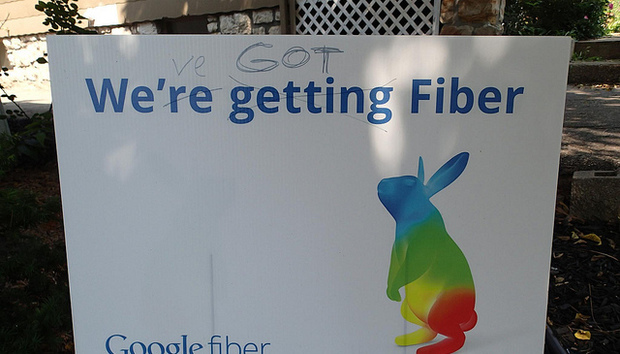 Elsewhere Google Fiber has been in the works for a number of years. It is gradually expanding to new cities each year and recently touched down in more areas of Georgia and has carried out feasibility reports in many other places. It promises superfast broadband speeds and has managed to spook many of the older ISP companies like Comcast and Time Warner Cable, who have all faced a backlash from customers over poor services and accusations of throttling. For example, Comcast recently put out ads in the Atlanta region – where Google Fiber just got hooked up – saying that its service is much better and warning people: “Don’t fall for the hype”. Google may offer an alternative. Its move into public housing and promise of free services continues to give it a leg up in several markets. And ISPs are not happy about that. « How is Cuba's target for getting online coming along?